This Katelyn Modern Pub Table Set is one of my favorite sets and is complimentary of any decor. 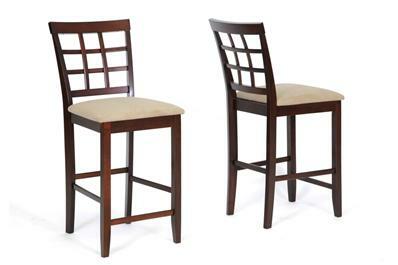 The espresso wood finish is sophisticated and the beige fabric seats give this set a comfortable, casual feel. Large enough to host game night, but intimate enough for Sunday brunch, this 7-piece set includes the pub table with six pub stools. Additional stools are available and sold separately. 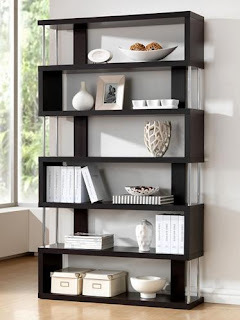 This artsy, modern bookcase will get you organized with ultimate style. Not only can this funky display shelf easily house your collection of Harry Potter books, but is also the perfect place to show off your prized bowling trophies or serve as your cat's dream jungle gym The dark brown finish will compliment any decor. This shelf is also available in 3 shelves. Ok so its not an Arco lamp. I didn't open a box and put one on the floor, I guess I am a little lazy. But if you are searching for an Arco lamp then you know what one looks like so my picture of an Arco lamp wouldn't be a surprise. But you probably have seen this little guy before. He's kind of cute and could go in the same room as the Arco, perhaps on a side table. Both are contemporary and no matter if you pick up the Arco lamp with the white marble base or the black marble base they will match. Its a nice little marriage made in heaven. Bar tables is a strange furniture category for residential homes. I've never been over to anyone's house where they have a really small table with matching chairs so we can be so close I can smell what they had for lunch on their breath. Bar tables are a good idea in restaurants and bars where they are trying to save space and the noise level necessitates the close proximity to your friend who is trying hard not to notice you are on a man date with them. But for the average apartment there's not enough room for a dining table, kitchen table and then a a separate bar table. I was looking at houses a few years back and I always like to start by looking in the 2 to 5 million range. Not that I can afford it but I like to see how the other 1% lives. What I found out is that people are successful at different times in their lives and they do a few things during those times. First thing they do is build a big house, second thing they do is build an office and a bar inside the house. I bet if you look inside most of the big houses in your area they have home offices and inside they have home office furniture. Since the people that are selling the houses are usually older empty nesters, they decorated their homes years ago. You can see some wonderfully dated offices that look like some lawyer from the 80s was really feeling good about wood paneling. What office space would be complete without a desk. I guess an office space that never had a plan for a desk would be complete. I always have this vision that people are now working at home on IPads, sitting on the couch, having a hard time time typing. I wonder what the average speed per minute typing is now that smart phones and pads are coming into style. I remember my typing class in high school, I got a terrible grade but computers really weren't out yet. My room mate in college had one, he had one chess game on it and a word processor connected to a dot matrix printer. The printer was so loud that you could hear it 3 apartments away. Sounded like a machine gun. This guy I know was a newly divorced dater. First thing he did when he rented a house was put a pool table in the living room. Pool seems like such an old game now, who even plays it? Bars should have big Microsoft Surface tables where people can get drunk and play Minecraft together. It would be like being at home, but out. If you think about this guy's pool table in his living room though, it was like he was out but he was in his home. Maybe I'm just coming up with ways to still do the things you like without talking to anyone. Anyway, in his bedroom he had a mattress on the floor of each room and no beds. I was thinking that the women that he was going to be dating, probably in their 40s, aren't going to want to hang out with a guy that sleeps on the floor. I believe that women at least want a normal bedroom. My first college mattress was my mattress from my home. I had no bedroom furniture except the bed frame that was under the mattress and box springs. I had slept on the same mattress from the ages of like 4 to when I was around 25. All of the accidents, all of the college dates, all on that bedroom furniture. Thinking about that now, that's totally gross. For everyone involved. When I finally moved into an apartment I chucked the mattress and stole someone's futon where I ended up sleeping on the floor because I didn't steal the frame. And to those people that called me and I denied stealing it, yeah I did it. I also made you feel bad about asking me. I'm not a terrible person I was just broke. What dining space would be complete without a dining table? Sure you could eat off the floor but if you have a cat or dog or any pet they won't have to beg anymore and they would be now so close with their pet breath. Makes meals a lot less enjoyable. So I guess an dining space that never had a plan for a table would not be complete. My tuna casserole, stay away kitty. Short on counter space in your kitchen, then where would you be without a kitchen cart? Running around I guess. Look you can wheel it around to different parts of the kitchen, say right next to your oven. So instead of constantly trying to grab stuff from the other side of the room while your cooking now you can just reach over and grab the spices. So convenient, so easy. Now I'm hungry. Hey, if it's a home office you still need office chairs. Most of us can't afford Herman Miller Aeron chairs, although they rock, so we have to wiggle ourselves into something that still feels good. We keep a few office chairs on the floor and in stock in our Chicago furniture warehouse, just enough to grab that guy that says "hey, I need an office chair" but we usually don't get the guy that says "hey, I need 100 chairs." So if you want one or two office chairs, we can be your guy. It's probably the same at Office Depot, if you want more than like 5 chairs they probably don't carry them in the store, they have to order them. Then you gotta drive back out with a truck, pick them up. It's a pain. Mirror Mirror on the wall what happened to you? Broke mine the other day, seven years bad luck they say. Now I need to find a new one. Which one hon? Black, brown or cream which one will it be? Oh wait I see. I think I just became the worlds worst poet, but at least I know Ill look good doing it! If Lincoln had a home theater, he'd still be alive now. I'm being told that people usually don't live past 130 but I don't think that would stop Lincoln. Home theater seating is for all of the people that really need a project, have some extra money and are willing to watch a movie in the room about once a month. I think we all had dreams where we sit quietly in this room and watch TV non stop but in reality the room usually gets used for napping. I wonder of Booth would have tracked Lincoln to his house and shot him there. Seems rather complicated to wait till he comes to your theater. Hey, if it's a dining room you need dining chairs. Most of us can't afford custom made chairs, although they rock, so we have to select something that still feels good and stylish. We keep a lot of dining chairs on the floor and in stock in our Chicago furniture warehouse, plenty for you to chose from no matter what your taste. So whether you need wood or leather or even acrylic dining chairs we got them. Even if you want one or two or 12 dining chairs, we are the man. It's probably the same at Crate and Barrel but you have to order them and then wait forever to have them delivered, Plus we are cheaper; a lot cheaper. I have seen everything from the modest to bizarre in the modern Lamps & Lighting category. When I'm looking through catalogs I try not to pick something that is either going to scare the crap out of me in the middle of the night (meaning something that is going to look like a person in the dark) or something that is going to take my eye out. Some of the floor lamps we have seen would have had to have been made for retired couples that have no grandchildren as they look so fragile that one touch would shatter them. We are trying to focus on practical, useful lighting designs that someone could take from a first apartment into a home and the style would carry on with most types of furniture. We are adding more and more each day to our dining room furniture collection. Which ones are your favorites or would work in your home? We have leather, microfiber, acrylic, wood dining chairs. Sets that seat 4 to 6 people and you can add seating. Buffet tables too. What is your style, formal, cozy, contemporary? I'm sure we have something that will fit. There is never enough space in our house when its winter time. Coats, hats gloves, snow pants, they have to go somewhere yet be available when the bus comes. Closet is too full, so that perfect Accessory for just such a job; a coat rack of course! Where do you store all your winter gear when the snow falls? I know my stuff will be within reach when the kids want to go sledding. I've never met a person in my life that has called a coffee table a living room table, but here we are. Our selection of living room tables includes see through acrylic, wooden, metal, pressed plywood and some glass and metal. We like to stock them pretty deep so people can take them home that same day. Did you know that we are a commission free sales floor? We wanted people to be able to buy without being hassled so if you want an item you can pick it out, if not you can go on your merry way. What kind of coffee table are you looking for? So I'm looking for a new entertainment center for my living room since I finally after five years finished it. I need a corner TV stand where I can actually hid my Xbox and cable DVR and all the Dora videos and still point the remote to access them. Why is this so difficult? And I need it to be dark brown so it matches the rest of my stuff. Well I think I found one. Having friends over this weekend. Need to stock up on wine and spirits quickly? This holds everything I could possibly need for a wonderful night of entertaining. Ever wonder if your wine cabinet could make it through the night when its fully stocked? With this one I know I won't have to worry even when the guests won't leave. Here is a picture of a new display shelf we just picked up. My last one which held our our knickknacks wasn't keeping the cat out who kept getting into it and knocking everything down. 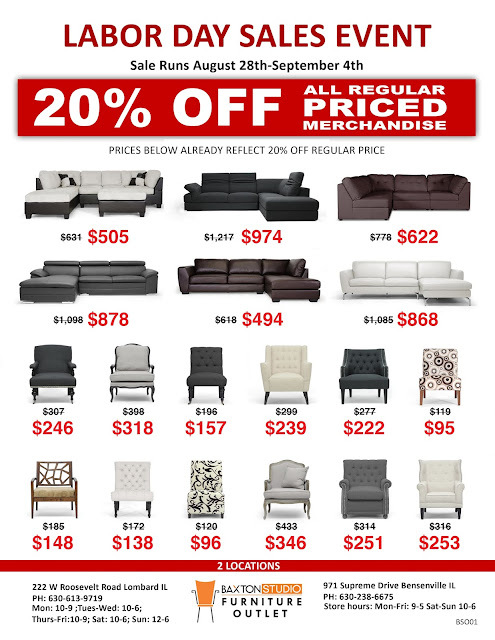 We are constantly trying to find new items to fit your needs. Mine was to keep the cat from the china. We have added a lot of wood book shelves models this year and have tried a few new colors, including black, espresso and white. We have found that the brown deep rich espresso color is the most loved fits my transitional decor. We have found that people like to buy items that are in stock and don't want that long for delivery. What shelf would fit your needs? Here is a picture of one of our new dining sets from our Chicago furniture outlet store. 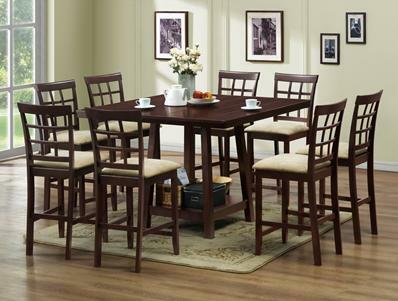 We try and carry different types of dining sets, including 5 piece, 7 piece and 8 piece dining sets. Many are contemporary dining sets but we do have quite a few traditional dining sets. We have some black dining room sets as well as the elegant espresso color sets. We stock them heavily as we have found that our customers don't want to wait too long for delivery. Most of our furniture is available for immediate pick up and if you car is large enough, you could take a dining set home with you. Which set best suits your needs? 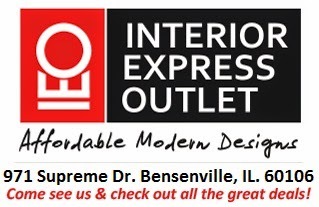 Here are a few ottomans from our Chicago furniture outlet store. We try and carry different types of ottomans, fabric, leather, storage and ones that can be used as coffee tables. We stock them pretty deep as we have found that people aren't crazy about waiting too long for delivery. Most of our furniture is available for immediate pick up and if you car is large enough, you could take one of the ottomans with you. Which one would look good in your home? Oh boy do we stock chairs. Right now we have stackable plastic chairs, metal chairs, wood chairs, fabric chairs, dining chairs, commercial chairs all in stock. A lot of local Chicago restaurants are coming in to buy lately and we are also ramping up for a big spring outdoor push. Which chairs would you like to see on your patio? We are doing our best to beef up our living room furniture collection. Which ones are your favorites? If there are other styles of furniture that you see out there that you think we should carry, please let us know here. 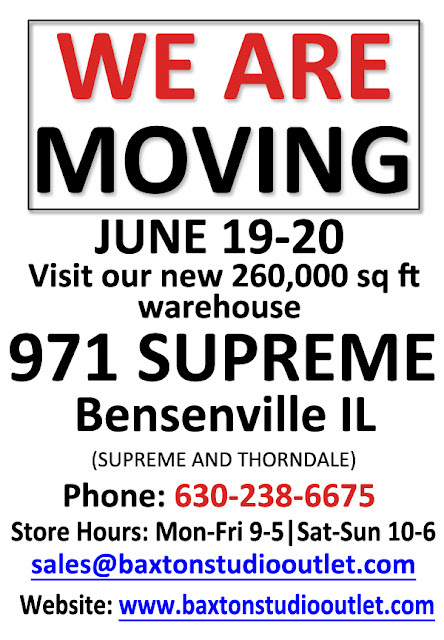 We are always on the look out for items to put in our Chicago furniture store.